This morning, my mother-in-law mentioned a new study out of the Université de Montréal that has shed light on the importance of maternal exercise on neonatal brain development. This was the first human study of its kind to measure the effects of exercise during pregnancy on newborn brain activity. The findings were presented yesterday at Neuroscience 2013, in San Diego, California. Eighteen pregnant women were randomly assigned to either an exercise group or a sedentary group. 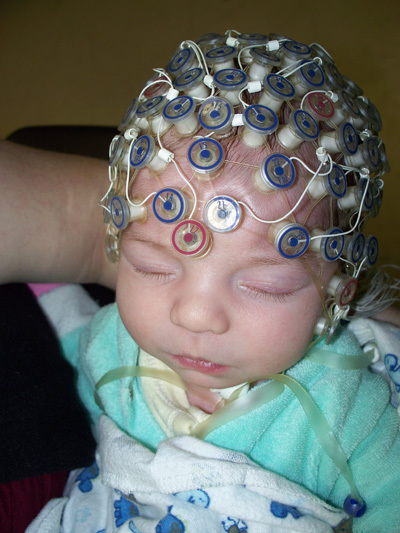 The brain activity of the newborns was tested with electroencaphalography (EEG) when they were between 8 to 12 days old. The findings indicated that 20 minutes of moderate cardiovascular exercise (causing slight shortness of breath or to be more technical, exercising at a minimal intensity of 55% of their max aerobic capacity), three times a week, resulted in more focused, mature, newborn brain activity. The researchers note that the study's findings are not intended to cast guilt on mothers who do not, or cannot exercise for health reasons (newborns in the sedentary-mum group showed normal brain activity), but suggest that exercise should be encouraged to pregnant woman who are capable. It should be noted that this study was performed with a group of 18 pregnant women - a considerably small sample group. Also know that the study is ongoing, in that the researchers will test the babies again at one year of age. The findings of this study are not exactly earth shattering. It is prrrretty well recognized that aerobic exercise is associated with countless health benefits for the vast majority of people, including expectant mothers. But it is great to see some preliminary research indicating a positive effect of maternal exercise on fetal brain development. Hmmmm….twenty minutes of brisk walking gets me to my favourite gelato store. Not that I am pregnant.